Remember that amazing little charmed object that Hermoine often used during her third year to double up on some of her classes? Well, we never really thought that she needed those extra courses just to make up for her half-Muggle upbringing since she was twice the wizard as anyone else! But, it is odd that such a powerful charm went missing and was never seen again, especially given how sad Ron was that Hermoine gave it back. Those kids managed to get into all sorts of trouble to recover vanished magic items, after all! Naturally, the only way such a thing wouldn't have been found again is if it had changed form! And, lucky for all of us, we found exactly where it was located. 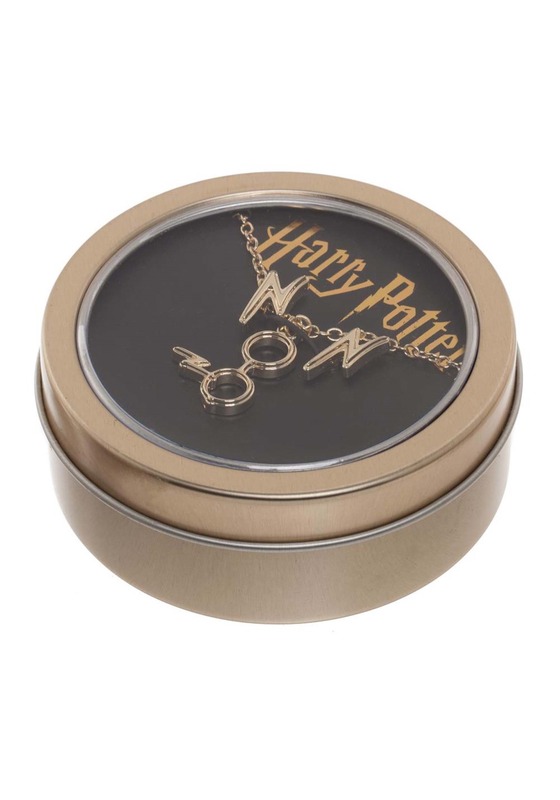 Test your ability to step through time with this Collector's Tin containing a wondrous set of Harry Potter jewelry. The lightning bolt earrings are a perfect accent to your look and the necklace features its own kind of charm: a pair of glasses struck by the scar of the Boy-Who-Lived! With this set of Harry Potter jewelry, you're certain to let everyone know that the books and films you love are basically eternal. Go back in time and relive those moments any time you wish when you feel the lightning bolts on this exquisite set!